Durango Herald file photo of the Taste of Durango. Copyright Durango Herald. Put on your eatin’ pants and lace up your drinkin’ shoes because it’s once again time for the Taste of Durango. 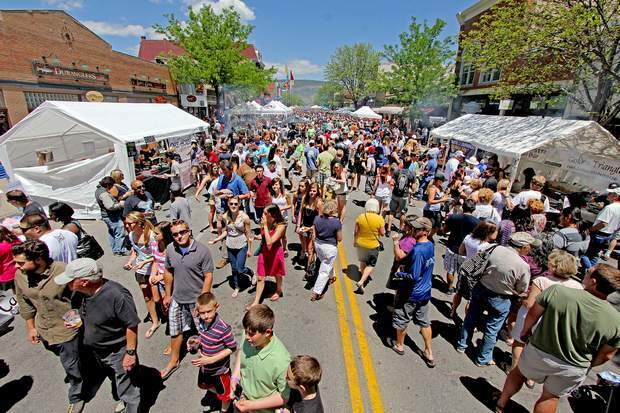 The annual festival will be held from 11 a.m. to 2 p.m. Sunday, May 18, on Main Avenue in downtown Durango. The festival does just what it says: gives everyone a taste (or several) of food from the city’s many great restaurants and beers from its five local craft breweries. Durango’s historic Main Avenue shuts down to traffic and opens up for the feast that spreads out along the downtown thoroughfare. Restaurants set up booths, breweries pour beers, vendors sell handmade goods, musicians play live music, and everyone enjoys a day of drinking, eating, dancing and playing. Kiddos will love the face-painting and balloons, while the grownups partake in beer flights and the best of Durango’s restaurants. With more restaurants per capita than San Francisco and five local craft breweries, this event has all the right ingredients to delight your palette for hours. Hop on the city’s free trolley to get from the Durango Quality Inn to the Taste of Durango festival less than a mile from our hotel. Book your room with us today!